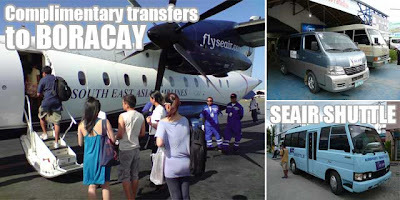 Boracay: SEAIR means convenience to Boracay all the way! I found myself on my way to Boracay again. The island does not have its own airport so you have to ride a ferry boat to get there. But flying on SEAIR is the most convenient option since they transfer you from the airport straight to Cagban Port in Boracay and back! But the convenience starts from the time you get off your vehicle at the Manila Domestic Airport. Now that most of the flights have moved to T3, there are less passengers crowding the place. Gone are the lines to show your ticket and ID to the guard, as well as the line at the x-ray machines. And there were no lines at the check-in counter as well. So I immediately got my boarding pass. It took me 15 minutes to get from the entrance, check-in and sit down in the passengers' waiting area! Since the Dornier planes are smaller than others, time to board passengers is also much shorter. So we were in the air in no time! Like in most domestic flights, I was expecting nothing much on board. In other local airlines, you have to buy your food and it's so pricey! While the rest, they give you a small snack and a glass of softdrinks, juice or water. So when the flight stewardess was going around, I was surprised when she asked, "How many packs of peanuts do you want?" instead of giving me just one small pack. I can't remember how many I got. For the Halloween trips, they also gave us a bottle of Gatorade. The flight was super smooth and we were in Caticlan in no time! At 35 minutes, these flights are the fastest in town! 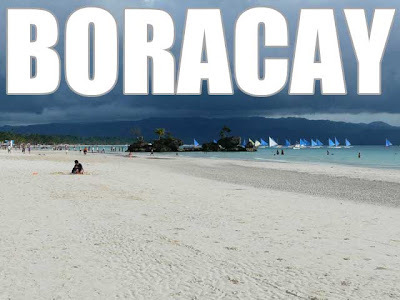 Less time lining up, less time flying, more time to relax and enjoy Boracay! And since it's the preferred airline of many celebrities, you just don't know who might be with you on the flight. As soon as I got out of the Caticlan Airport, the SEAIR ground staff were waiting to assist me. Buses and vans wait outside to bring you to the Caticlan Jetty Port. SEAIR pays for your boat ride and you only have to pay for the Terminal and Environmental Fees. The staff are so accommodating in fact, they accompanied me all the way to the boat! On Boracay, my SEAIR boarding pass also served as a discount and perks card. So if you do take SEAIR, make sure you check what promos are available. Going back to the Caticlan Airport was a breeze as well. At the Cagban Port, all I had to do was look for the SEAIR table and I was taken care of until I got to the airport. Indeed, SEAIR has positioned itself as the premiere airline to Caticlan/Boracay, where you get great service and really fast flights! Get a 15 percent discount of SEAIR fares! Ivan About Town is giving a 15 percent discount to everyone on SEAIR fares. Just book online at www.flyseair.com and enter hhhh88ii as the promotional code. "It's one of the smoothest flights I've ever had to Boracay" - Chris Tiu on his SEAIR flight last Halloween. 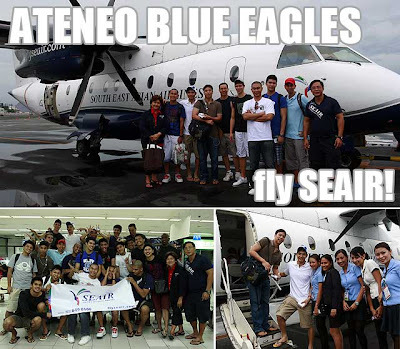 Thanks to Choi Eliciario for the photos of the Ateneo Blue Eagles!